Bottle: The iconic green bottle with the lone red star. Few beers in the world are as iconic as Heineken. Legend has it that the grandson of the original founder of Heineken is the genius who made the ‘e’ in the label smile so that it would appear more friendly (check out these top 10 facts about Heineken). Blurb on the bottle: The world’s most international premium lager. Brewed under supervision of Heineken Brouwerijen B.V. Amsterdam, Holland. Brewed by DB Breweries Limited, Auckland, New Zealand. Ingredients: water, malted barley, hops. Tastes like: The archetypal lager. Heineken is a super-inoffensive lager with a stronger, bitterer taste than most internationally mass-produced lagers. It’s perfectly carbonated, pours a straw yellow colour, with little or no head to speak of. It goes down smoothly when it’s ice cold. Is it the best beer ever? 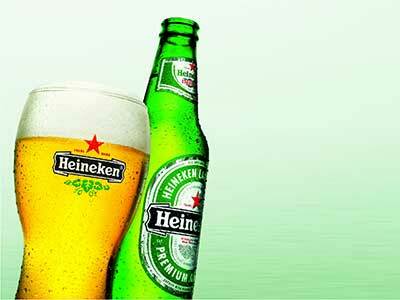 Heineken, to my mind, is the lager which you compare all others against. That doesn’t mean it’s the best lager ever – just that it’s the most famous. Heineken is like the Coca-Cola or McDonald’s of the beer world. You always know what you’re going to get with a Heineken. Surely no-one would ever say Heineken is the best beer in the world. However, I honestly do believe that Heineken probably is a wee bit better than a lot of the other internationally available mass-produced lagers out there. I have to ask the question, though: does it bother any of you that the Heineken you’re drinking was probably made locally and not in Heineken’s Dutch brewery? According to researchers at the University of Seville, beer varies a great deal depending on where it comes from – so the Heineken you drink in New Zealand, say, will subtly be different to the real deal in Amsterdam. Despite the fact that they make it to the same recipe, they’ll be using local ingredients. Spare a sympathetic thought for all the people out there who drink Heineken because they think it makes them cultured to drink international lager. Never mind the fact that the “international premium lager” they’re drinking was made just down the road.